A Russian version of this page is also available. For latest (updated Mar. 13 2007!) IOCCC news and my remarks about some of the past contests, please see my IOCCC page. Hangup or leave a message, omitting the obvious extra characters before sending it? A solution for the Nokia mobile phone Rotation game. A how to convert a picture into a Nokia color operator logo. There was a Soviet desktop microcomputer line somewhat reminiscent of Terak 8510/a, called Elektronika BK, sold from around 1985 (1984?) to mid-1990's. They also had an LSI-11 (on a single chip) for a processor, a hardware-scrollable frame buffer (alas, without the character generator), but, as they were intended primarily for high schools and home entertainment their primary data storage was cassette tape (the school model had a current loop connection). Floppy disk controllers came later. There were two major models: BK-0010 and BK-0011 with different RAM sizes. In both of them, as there was no hardware character generator and the floppy controller was not included in standard configuration, a significant portion of the address space was devoted to the BIOS that handled text output to the screen and some drawing operations, the bitmapped font, and Basic (in very early versions of BK-0010 - Focal), leaving only 32Kb of RAM on BK-0010, including the frame buffer. Like on Terak, it was possible to turn off refreshing of a part of RAM to give more memory to an application. BK-0011, as well as its more successful modification BK-0011M, had 128 Kb of RAM (but no MMU) and, in a configuration with a floppy drive, was able to run an OS resembling RT-11. I own a few of those computers (still working), and I have written an emulator for them. The instruction set emulaton is loosely based on the source of a very old PDP-11 emulator by Eric Edwards. I plan to adapt the emulator for Terak as soon as anyone can give me the boot ROM dump. A tune (RealAudio (96K); MPEG 3: download (140K), listen), that I like a lot: this is the ex-theme song of the CBS "Chicago Hope" series, by Mark Isham. I'd like to have an equivalent MIDI file (or a scanned music sheet). HTML5 audio applet should be here. One more tune (MPEG3 (33K); RealAudio (33K)), that was used as the theme song for a popular Russian TV show, but few people know its real origin. Would you guess? Send your answers to qleobq@xmailcomx.com (omit obvious extra characters before sending). A joke (MPEG Layer 3 135K download, listen). If you know the author of the joke, please let me know (you know what to do with the address). Borromean rings made of paper clips. 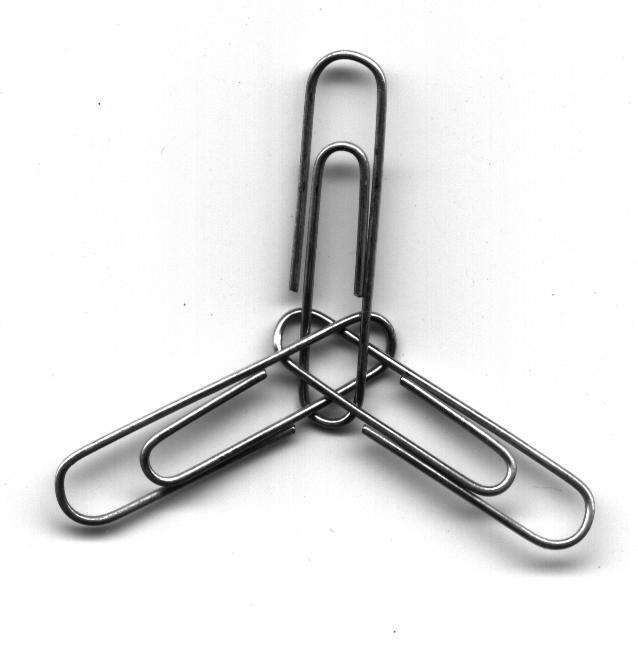 Can you do it without bending the clips? A script that tells you if speeding is useful. 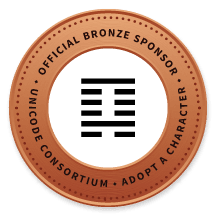 The Unicode Consortium. On the right - the character I've sponsored. The International Obfuscated C Code Contest. Look for my name among the People who have won. Starting from the Contest held in 1998, I'm also one of the judges. An article by Mark Nelson on Burrows-Wheeler Transform, published in Dr. Dobb's Journal, that I have some relation to (see Acknowledgements). The On-line Encyclopedia of Integer Sequences. MathWorld. The result was achieved using an engineering calculator when I was approx. 15 years old. ...one is not to have the exercise of his liberty of expression in appropriate places abridged on the plea that it may be exercised in some other place. This page has had its 38,133rd call.